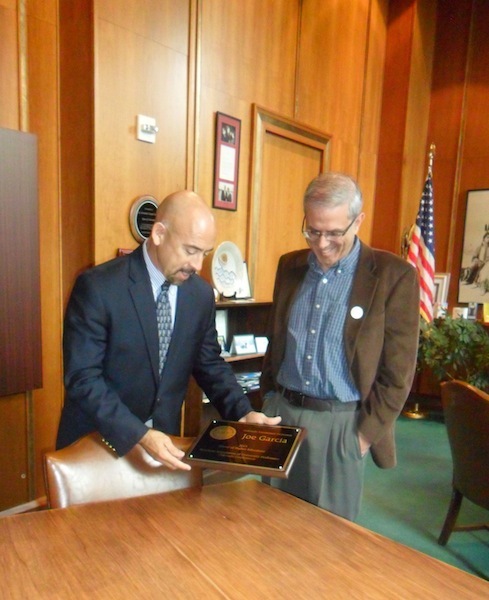 Colorado’s Lieutenant Governor Joe Garcia was given the Colorado Conference’s 2013 Friend of Higher Education Award on Thursday, September 19 in a brief ceremony at his office in the state capitol. Conference Co-Presidents Steve Mumme and Jonathan Rees attended, along with Executive Committee members Suzanne Hudson and Caprice Lawless. The Friend of Higher Education Award honors Colorado legislators who distinguish themselves as supporters of higher education in the state. Mr. Garcia is the first non-legislator to win the award. He is the former president of CSU-Pueblo and Pikes Peak Community College.